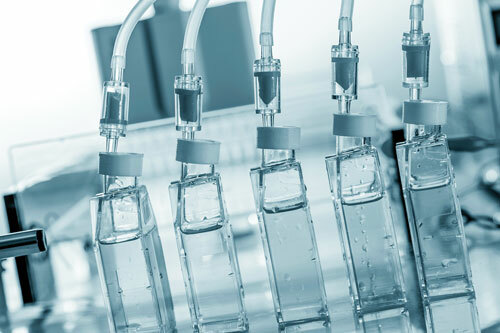 Single-use devices continue to make inroads into the biopharmaceutical manufacturing community, leading to a strong focus on implementation and integration—in other words, the consolidation of existing innovations. And yet biopharmaceutical manufacturers want additional innovations. 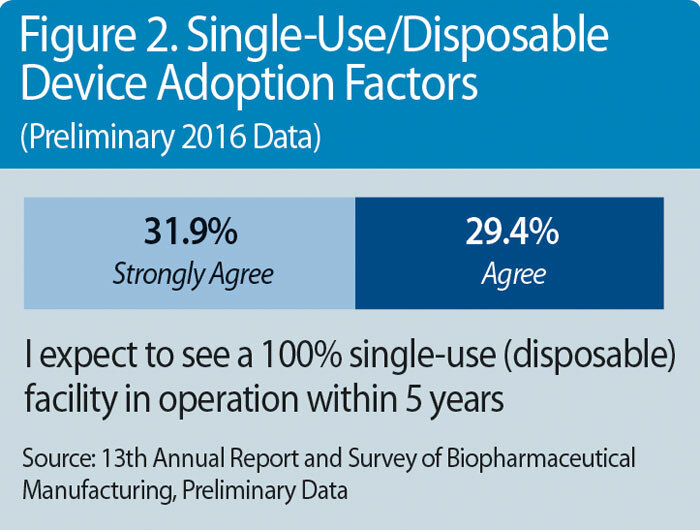 According to BioPlan Associates’ current industry study,1 biopharmaceutical manufacturers are still compiling wish lists topped by single-use devices. Preliminary results from this study indicate that disposable applications account for four of the top five products cited by biomanufacturers asked to rank suppliers’ development options. Presented with 23 prospective products and services, survey participants responded as shown in Figure 1. 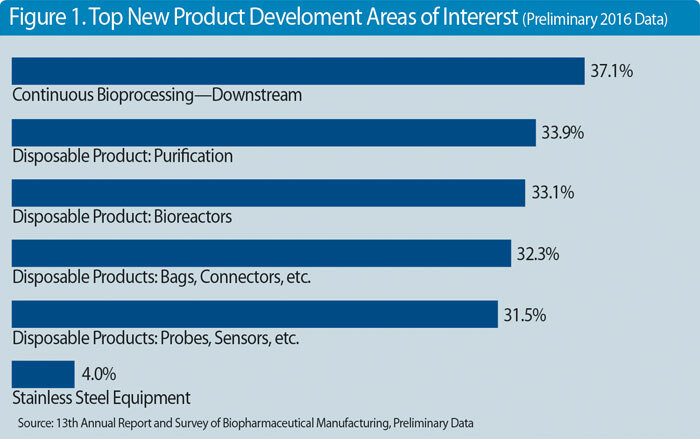 Meanwhile, the desire for disposable bioreactor innovation points to a future in which purification products will be the predominant devices used in clinical- and commercial-scale manufacturing. Already, this year, respondents are more likely to say they would implement a single-use than stainless-steel bioreactor for a future clinical-scale biologics facility. And while batch-fed stainless-steel bioreactors are still the main choice for a commercial-scale facility, a sizable share of survey respondents said that they would specify a batch-fed single-use bioreactor for such a facility. Add it all up, and an industry consisting of predominantly—or even wholly—single-use facilities is on the horizon. For example, according to preliminary results from the current survey, almost 6 in 10 respondents expect to see a 100% single-use (disposable) facility in operation within five years, up from slightly fewer than half who felt that way last year. Likewise, almost half of respondents believe that within the next five years at least half of their own facilities’ cGMP clinical/commercial unit operations will be substantially done using single-use technology (Figure 2). Within this context, the desire for continued improvements and refinements to disposable applications is understandable, even if compatibility and interchangeability become more essential to realization of this future. The End of Stainless-Steel Innovation? In sharp contrast to the consistent demand for single-use innovation is the disregard for innovation of stainless-steel equipment. In the aforementioned list of most-favored products and services, stainless-steel equipment ranked dead last, cited by just 4% of respondents. This is not a unique result. For example, stainless-steel equipment ranks near the bottom of innovation desires, typically cited by 10% or fewer of respondents. This by no means suggests that stainless-steel innovation is at a standstill, or that it should be. After all, while single-use equipment may be the wave of the future, stainless-steel equipment still dominates commercial manufacture. As a result, continued improvements to this equipment are not going to cease. Instead, what seems likely is that innovation that relates to stainless-steel equipment will come in the form of hybrid designs. These will combine proven and standardized stainless-steel technology and new single-use technology. With the industry moving toward more flexible structures, any innovations that can serve to make stainless-steel facilities more modular will also be welcomed in the near future. 1. 13th Annual Report and Survey of Biopharmaceutical Manufacturing Capacity and Production. BioPlan Associates. April 2016. 2. 12th Annual Report and Survey of Biopharmaceutical Manufacturing Capacity and Production. BioPlan Associates. April 2015. Eric S. Langer (elanger@bioplanassociates.com) is president and managing partner at BioPlan Associates.